The Motor City Muslims 16U AAU basketball team. To achieve and maintain a balance between pride, identity and assimilation is a constant challenge for any minority group trying to survive and thrive in a larger society. Whether it’s your hair, your clothes, your speech or your values, each decision you make regarding how you present yourself to the world can be criticized by somebody somewhere as too much or too little, passive or aggressive, meek or militant. And one of the most complicated dilemmas is simply what to call yourself — and what you want others to call you. Yahoo! 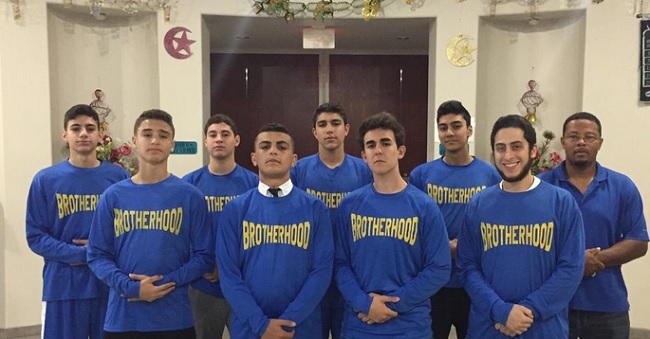 Sports writer Jeff Eisenberg recently penned a feature on the Motor City Muslims, a group of high school student-athletes who are believed to be America’s only all-Muslim AAU basketball team. For these teen ballplayers, their name alone has drawn more attention than their game. The Motor City Muslims are a young program, having debuted just a few months ago on the 16-and-under AAU circuit in Michigan. Program founder Ali Altimimy and coach Clarence Archibald haven’t had time to produce a legacy of star-studded alumni who have gone on to earn college scholarships and make it to the NBA, like the famous Atlanta Celtics (Dwight Howard, Derrick Favors), Boo Williams (Allen Iverson, J.J. Redick) or New York Gauchos (Stephon Marbury, Kemba Walker) AAU juggernauts. In an era when young Muslim Americans sometimes try to avoid detection by removing any outward signs of Islam in public and by going by names like “Mo” instead of “Mohammed,” Archibald’s players boldy chose to wear their identities across their chests. They named their team the Motor City Muslims and emblazoned a custom-made logo on the front of their jerseys featuring a basketball player clad in a traditional Islamic robe and turban. Such an unconventional choice made it difficult for the Motor City Muslims to keep a low profile at the tournaments they attended in Michigan this year. Strangers often gawked or whispered when the team prayed together between games or broke its huddles by shouting in unison “bismillāh,” the Arabic word for “in the name of God.” Other teams also tended not to take the Motor City Muslims as seriously as they would have opponents of a different culture or skin tone. Perhaps it is indicative of American’s cultural and moral diversity — or perhaps it’s just good ol’ American hypocrisy — that the same country in which a loud segment of sports fans defend Washington D.C.’s NFL team in its use of the “Redskins” nickname could also generate controversy over a self-chosen team nickname that simply identifies a minority group without using an offensive slur.